Turn the oven on to 350 °F. Season the pork chops on both sides with salt and butter. In an oven proof lidded saucepan stir-fry the pork chops in butter and olive oil. 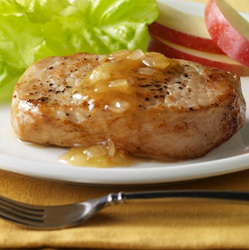 Remove the pork chops leave to rest. Add the onions, garlic and parsley to the pan, and fry till soft and brown. Add the cider to the pan to deglaze, bring to a simmer and add the pork chops back to the pan. Cover and place in oven for 15 minutes with the lid on and 15 minutes with the lid off. To serve place the pork chops on the plates and ladle the sauce over the pork chops. You can serve this plate with a mustard mash potato and lettuce salad.